The theory of multilevel methods for solving Ritz-Galerkin equations arising from discretization of elliptic boundary value problems is by now well developed. There exists a variety of survey talks and books in this area ( see e.g.Xu ,Yserentant ,Oswald ). 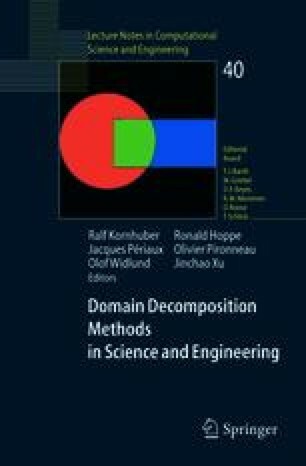 Among them the additive methods are based on a suitable decomposition of the underlying projection operator (thus including also domain decomposition methods). In particular there is a close connection with classical concepts in approximation theory via so- called Jackson and Bernstein inequalities. These provide norm equivalences with the bilinear form underlying the Ritz- Galerkin procedure and thus preconditioners for the arising stiffness matrix. The size of the constants in this equivalence is crucial for the stability of the resulting iteration methods. In this note we establish robust norm equivalences with constants which are independent of the mesh size and depend only weakly on the ellipticity of the problem, including the case of strongly varying coefficients. Extensions to the case of coefficients with discontinuities are possible, see Scherer [2003/4]. In the case of piecewise constant coefficients on the initial coarse grid there exist already estimates of the condition numbers of BPX-type preconditioners independent of the coefficients (see Yserentant , Bramble and J.Xu ) however they depend still on the mesh size (of the finest level).